If making applications for the Android OS is your dream gig, look no further than the latest deal to hit the DL Deals Store. 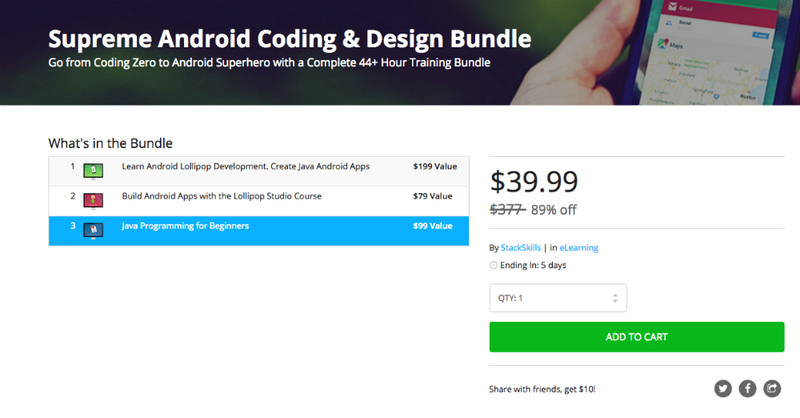 Titled the Supreme Android Coding and Design bundle, this package contains countless lectures within 3 courses for just $40 to help you become a master of the Android development process. The first course, which is your starter, is Learn Android Lollipop Development. Inside, you will learn the basic to the advanced ins and outs over 183 lectures of information. Here, you will begin your lessons in Java, while creating apps with step-by-step guides. After this, you will open up the Lollipop Studio Course. With over 85 lectures, you should be creating apps from start to scratch in no time at all. Follow it all up with a Java Programming course and you should be good to go. If you want to be a developer, and maybe even make the next big app that gets bought by Google for millions, follow the link below. Hey, it could happen!